Neo4j has released its 3.1.0 version of their graph database as of Dec 2016. [root@obrien ~]# scp michael@192.168.15.7:/Users/michael/Dropbox/neo4j/neo4j-enterprise-3.1.0-unix.tar.gz . 2016-12-18 23:25:26.073+0000 INFO No SSL certificate found, generating a self-signed certificate..
2016-12-18 23:25:27.227+0000 INFO Bolt enabled on localhost:7687. This section details several ways to get an embedded version of Neo4j running in a spring container. The 7474 browser no longer directly works out of the box on Neo4j 3.x as it did in 2.3. Partially because of the introduction of bolt. 2016-12-18 03:37:42.490+0000 INFO [o.n.b.v.r.WorkerFactory] Bolt Server extension loaded. 2016-12-18 03:37:42.490+0000 INFO [o.n.b.v.r.WorkerFactory] Bolt enabled on localhost:7687. It turns out with a bit of help from the following post we can still bring up a wrapping NeoServer around our embedded mode Neo4j 3.1.0 server. This code however is not integrated yet with our HA listener overrides on the constructor tree we bootstrap in Spring - so is a POC. With this NeoServer wrapper code - we don’t need the secondary workaround where we bring up a 2nd Neo4j server mode instance, bring up its’ 7474 browser and modify the bolt address (default 7687) in the config to point to the exposed (7688) embedded mode graph.db - without bringing either Neo4j server down as long as they point to different graph.db instances - in effect sharing the 7474 browser as a bolt client. Disclaimer: I believe a proper architecture involves a clustered set of server mode bolt enabled Neo4j servers. This undocumented/internal API is used as a temporary workaround to get the neo4j browser up on an embedded Neo4j server in 3.1.0 as it used to work under the WrappingNeoServerBootstrapper in 2.3 so we can continue to use in-jvm Dijkstra algos until we are able to rework/benchmark the same or greater traversal speed via a bolt enabled cluster. 2016-12-20 01:28:04.533+0000 INFO Bolt enabled on localhost:7687. 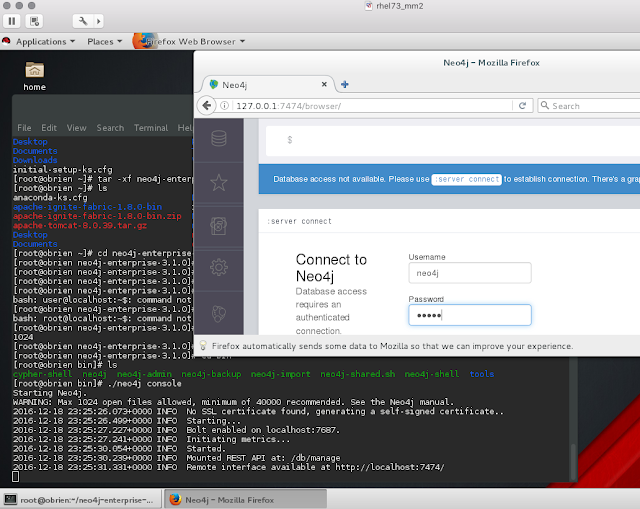 Debugging we see that we get the proper Jetty server available usually only to server mode Neo4j not embedded mode. 2016-12-20 02:15:03.304+0000 INFO Bolt enabled on 0.0.0.0:7688. 2016-12-20 02:15:03.304+0000 INFO [o.n.b.v.r.WorkerFactory] Bolt Server extension loaded. 2016-12-20 02:15:03.304+0000 INFO [o.n.b.v.r.WorkerFactory] Bolt enabled on 0.0.0.0:7688. This code however is not integrated yet with our HA listener overrides on the constructor tree we bootstrap in Spring - the following scrubbed/distilled mirror POC of our corporate production code will be adjusted in the next post. In this code we get everything (except causal cluster using the raft protocol). With a few modifications I was able to wrap a HighlyAvailableGraphDatabase with a EnterpriseBootstrapper. There are some non-fatal exceptions around JMX reporting in debug.log likely related to my 8.0.28 tomcat version but the graph db running embedded in Tomcat is OK.
2016-12-21 16:20:00.574+0000 INFO Bolt enabled on 0.0.0.0:7688. 2016-12-21 20:51:07.478+0000 INFO [o.n.k.i.s.c.CountsTracker] About to rotate counts store at transaction 9 to [/ec2-user/data/databases/graph.db/neostore.counts.db.b], from [/ec2-user/data/databases/graph.db/neostore.counts.db.a]. 2016-12-21 20:51:07.480+0000 INFO [o.n.k.i.s.c.CountsTracker] Successfully rotated counts store at transaction 9 to [/ec2-user/data/databases/graph.db/neostore.counts.db.b], from [/ec2-user/data/databases/graph.db/neostore.counts.db.a]. Disclaimer: I believe a proper architecture involves a clustered set of server mode bolt enabled Neo4j servers using causal clustering under the raft protocol. This undocumented/internal API is used as a temporary workaround to get the neo4j browser up on an embedded Neo4j server in 3.1.0 as it used to work under the WrappingNeoServerBootstrapper in 2.3. Use of the embedded server for faster traversals was the use case - performance must be reevaluated to see if a bolt based architecture is more optimal for the traversal API. how did you fix this error? Client triggered an unexpected error [UnknownError]: Exception invoking method writeBufSize.